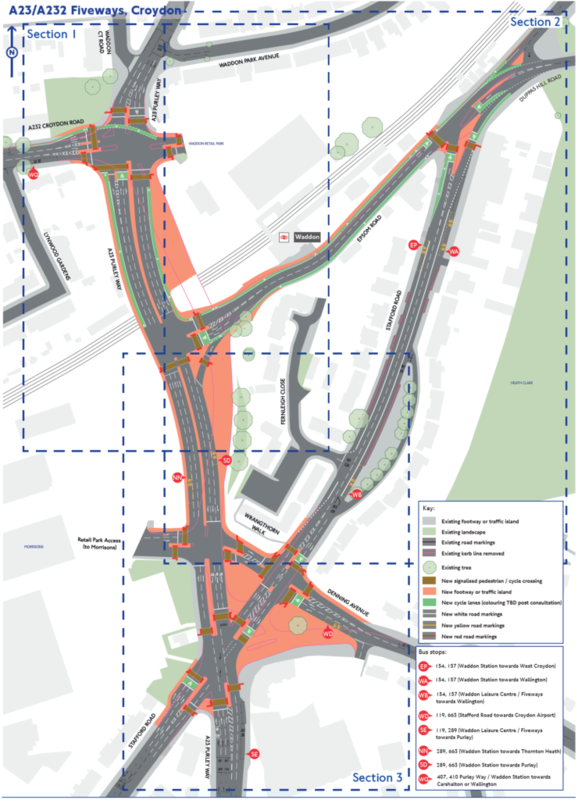 Transport for London are currently consulting the public on their plans for Fiveways junction, the part of Croydon where TfL trunk roads A23 Purley Way and A232 Croydon Road / Stafford Road / Duppas Hill Road intersect with local council roads, the B271 Stafford Road, and B275 Denning Avenue and Epsom Road. 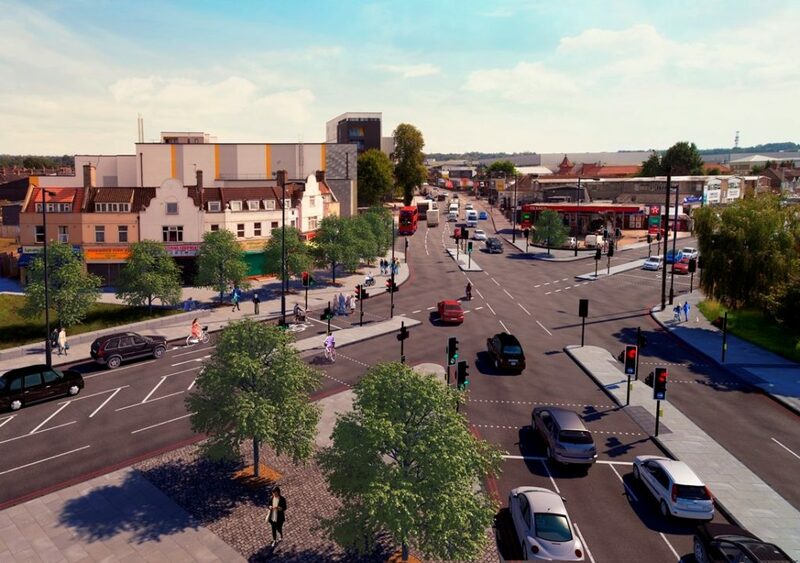 Specifically, TfL say that their proposals would make “Fiveways junction simpler and increase capacity to accommodate expected traffic growth arising from population and economic growth in the area”. These claims don’t stand up to scrutiny. The population of London has grown by around 20% since 2000. Croydon has grown by a more modest c14% in the same period. So, what has happened to motor traffic levels during that period of population growth? In Croydon, according to data amassed by the government’s Department for Transport, it has declined by 16% since 2000. Indeed, drilling down into data for traffic counts in the Fiveways area shows very similar results. 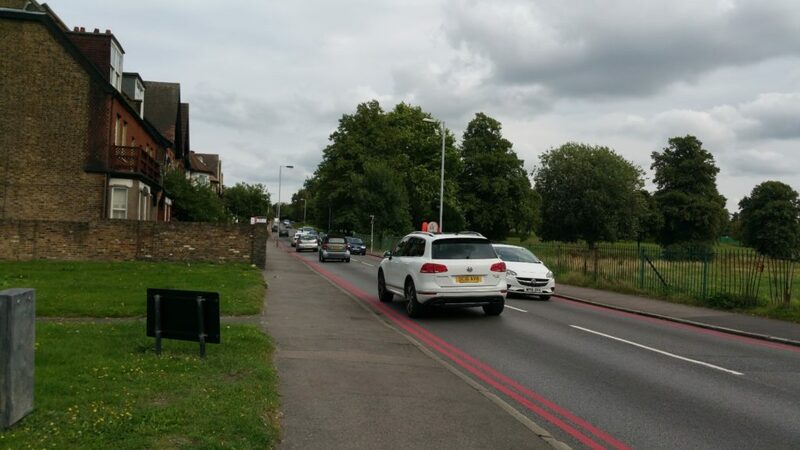 For example, the bridge over the railway at Waddon – which TfL want to widen at huge public cost – shows a decline of c15% since 2000 in the “average annual daily traffic flow” of all motor vehicles – motorcycles, cars, taxis, buses, vans and lorries. Average Annual Daily Flow figures give the number of vehicles that will drive on that stretch of road on an average day of the year. 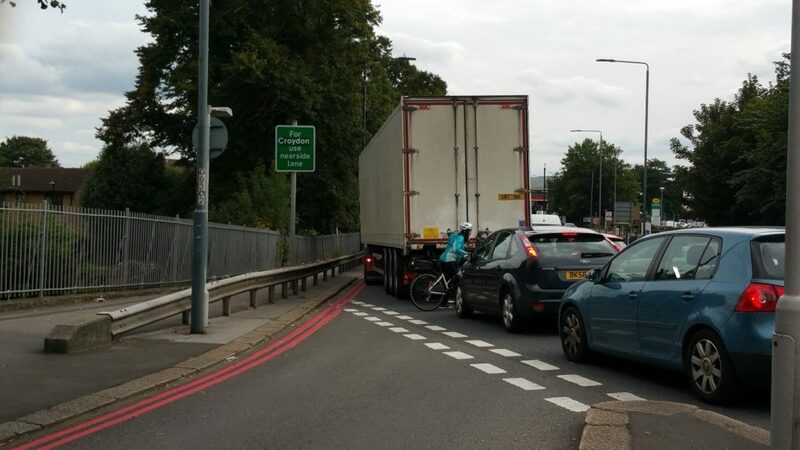 According to the TfL spokesperson at the recent Croydon council cycle forum meeting that discussed the plans, there is “no demand” for cycling on the Purley Way. However, the DfT data show that there was one class of road user which actually increased by 11% since 2000 – and that’s cyclists. So, it is quite wrong of TfL to say that population growth and motor traffic growth go hand-in-hand. The real reason that TfL and Croydon Council want to “improve” Fiveways is what they euphemistically describe as “economic growth in the area”. Everyone knows that this is code for Westfield, the international retail development company, who have grand designs in mind to replace the nearly 50 years old Whitgift shopping centre in central Croydon. But is it true that, despite the fall in motor traffic on Croydon’s roads, that replacing the Whitgift with a Westfield would reverse that drop? Let’s take a look at what happened in the White City where London’s first Westfield was opened in 2008. Using the DfT data source mentioned above, we again see a decline in motor traffic in Hammersmith & Fulham since 2000, and in particular, since 2008. Even if we focus on the traffic counts on one of the roads closest to the shopping centre itself, the A3320, and compare the car counts at that point in 2016 with 2008, there’s been a change of less than quarter of one per cent. But what if TfL went ahead anyway, and re-built Fiveways to enable more people to drive to and through these junctions? As numerous studies have pointed out, most notably by Parliament’s Standing Advisory Committee on Trunk Road Assessments in 1994, we then have the problem of “induced traffic”. When a new road is built, new traffic will divert onto it. Many people may make new trips they would otherwise not make, and will travel longer distances just because of the presence of the new road. TfL still use outdated predict-and-provide computer models to justify their extravagant use of public money to build roads that generate the motor traffic they said it would; it’s the very opposite of a virtuous circle, but it keeps them employed. This increase in cars going through Fiveways might in theory be great for Westfield, but it’s not great for Croydon’s transport network, since it will have an impact on other roads, not just the A23 and A232, and of course, will be bad for our environmental health. Statistics compiled by King’s College London show that our town centre’s air quality has long been in breach of EU safety limits, and encouraging and enabling more people to drive into an air pollution hot spot is not going to help at all. The government have passed the buck on this, in the face of legal action from environmental lawyers at ClientEarth. 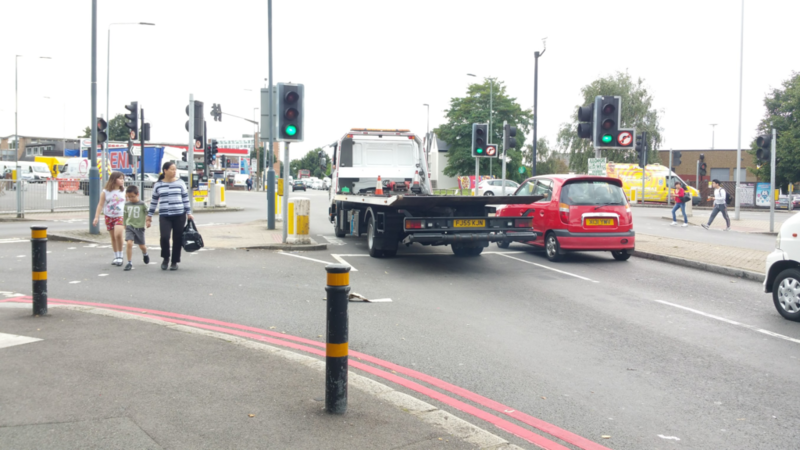 It seems that TfL and Croydon Council can’t be bothered either, despite the threat of legal action. 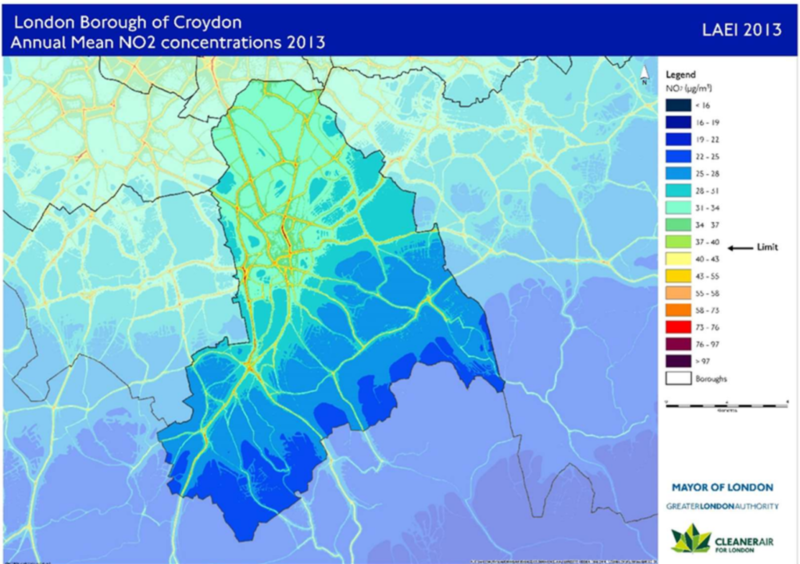 Croydon Council’s draft Air Quality Action Plan for the next five years states that “Croydon is meeting all of the national Air Quality Strategy objectives other than for the gas nitrogen dioxide (NO2). The red strips in the map below represent high and illegal levels of NO2, and can be seen in the approach to Fiveways, which TfL want to expand, and Wellesley Road, where they want to route this increase in motor traffic towards Westfield. The Action Plan acknowledges that “of the pollution that originates in the borough the main sources of NO2 are road transport at 60% …” Sadly, there is no firm plan or target to reduce motor traffic, despite what it is doing to people locally and to the planet through climate change. 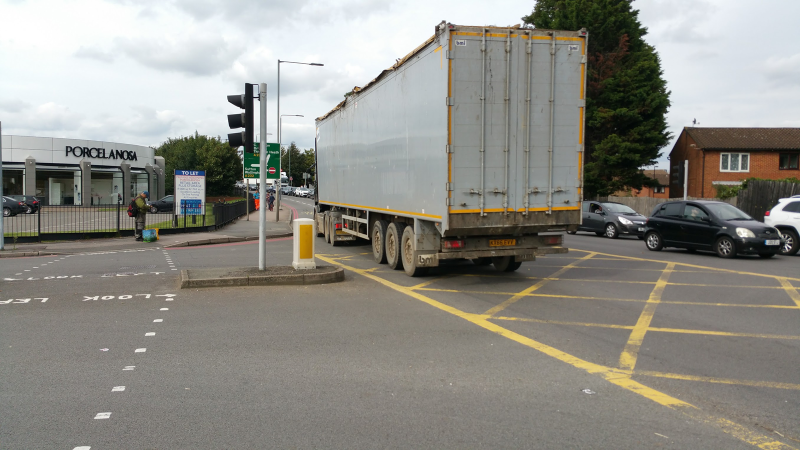 What of the plans for Fiveways and their impact on cycling? They appear fragmented, parochial, in some cases non-existent. They provide a patchwork of good, poor and downright dangerous facilities. 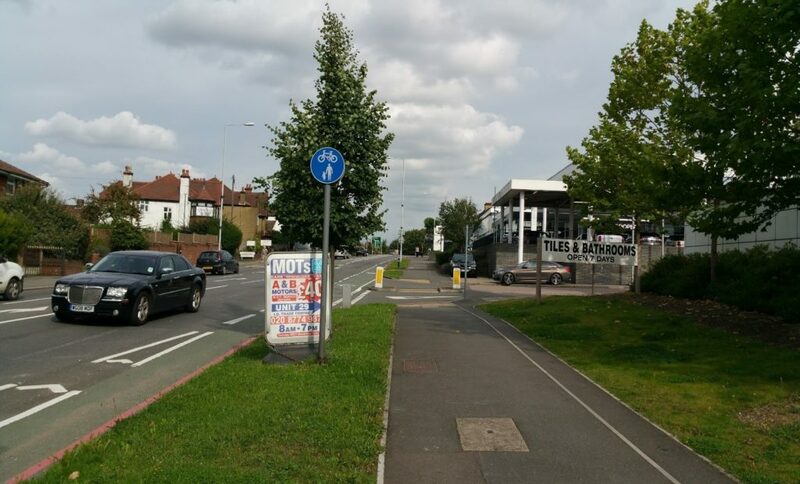 They fail to acknowledge the existence of attractions like Waddon Ponds, Waddon Leisure Centre and the new Harris Academy; it is a paradox that TfL’s plans are based on enabling out of towners to drive from the M25 into Croydon while not helping local people walk or cycle conveniently and safely to the park, gym, school, railway station or shops. 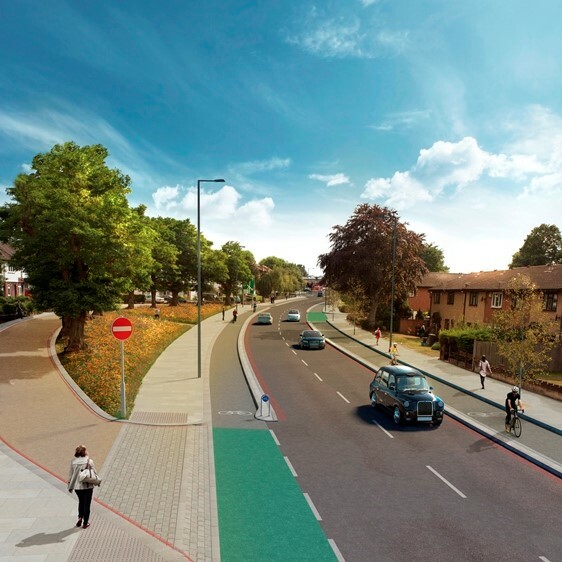 TfL say they will make it easier to cycle from west – Beddington – to east – Waddon. In itself, this is welcome, but the eastern approach to this improvement is via a half-baked cycle path that disappears about 900 feet short of the junction with Purley Way, and ends on the wrong side of the road. What TfL have effectively ignored is how people get back from east to west. Their plans show people cycling up a dedicated cycle path along Epsom Road, from the Waddon Hotel towards the junction with the Purley Way. 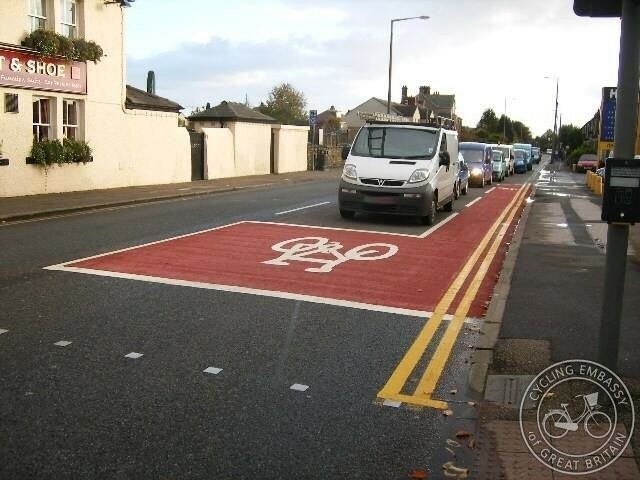 What they don’t address is how to get to that cycle path. 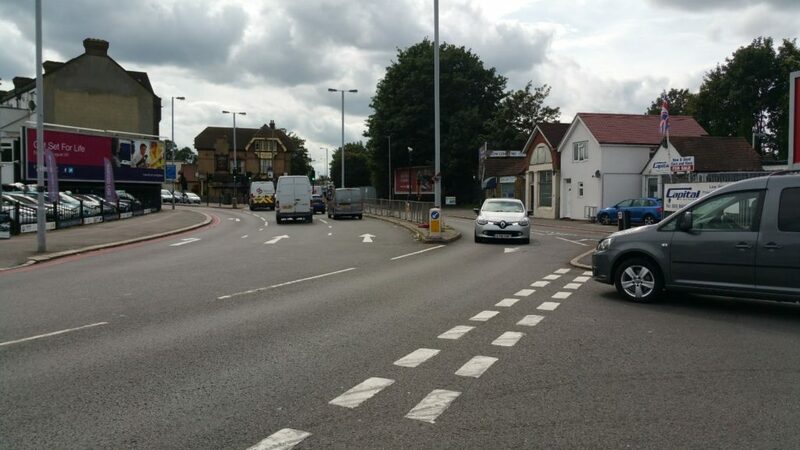 As things stand, anyone cycling from Croydon will most likely have to emerge from the part of Epsom Road at the junction shown below, and make their way into the middle lane occupied by the two vans. This means trying to cross the east and west bound lanes of the A232, hard enough if you’re driving a bus or a car, but very uncomfortable and difficult if you’re on a bike and competing for road space with motor vehicles going up and down Duppas Hill Road. Similarly, cycling from central Croydon towards Fiveways itself is not going to be made any easier. The original TfL plans show segregated cycle lanes. 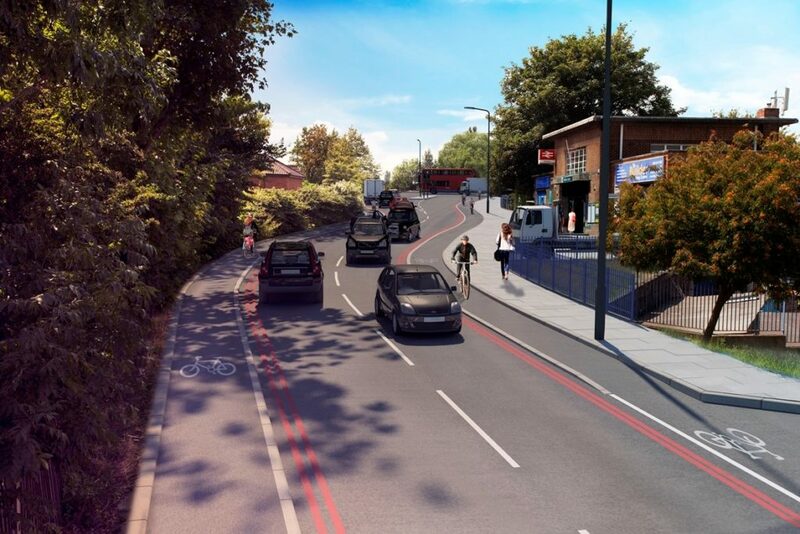 The sanitised image of the actual Fiveways junction reveals that anyone cycling from Croydon to Wallington or vice-versa is going to be given only Advanced Stop Lines to help them across. Why are Advanced Stop Lines not a good thing? 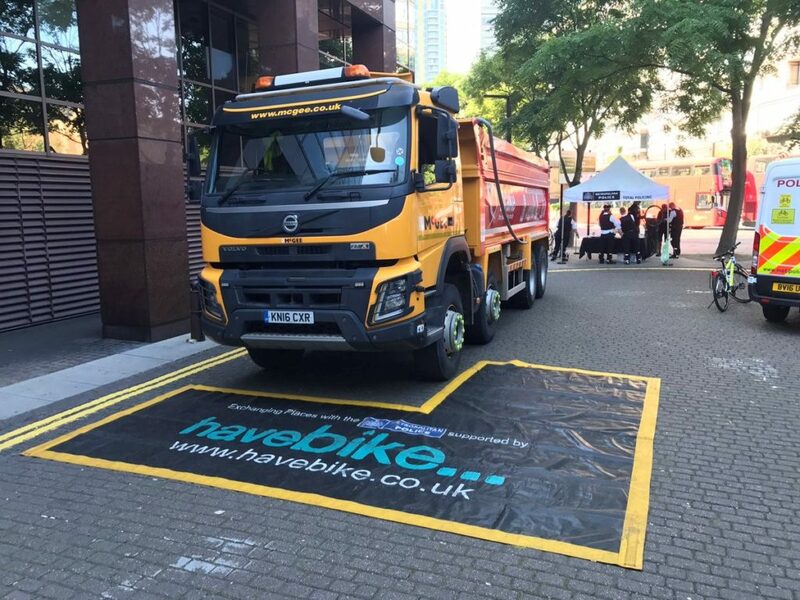 Well, as the Tweeter @benjamindilzraeli helpfully observed, they look an awful lot like the HGV blind spots that safety advisers tell cyclists to avoid. The North-South routing along the Purley Way is not going to be much changed. While the woman struggling to get home without being killed would have the option of riding legally on the pavement towards Fiveways, her return journey will not be improved and she’ll still have to compete with trucks. TfL glibly dismissed cyclists’ safety considerations here on the grounds of expense. 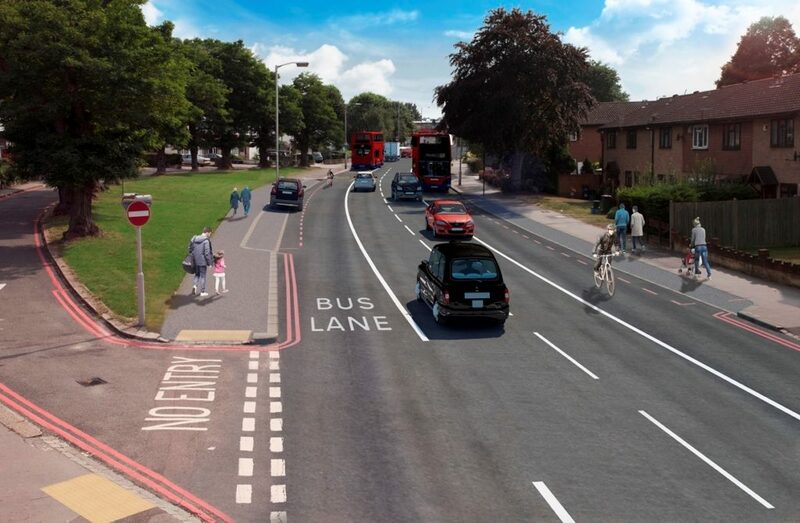 So, what would make Fiveways better? 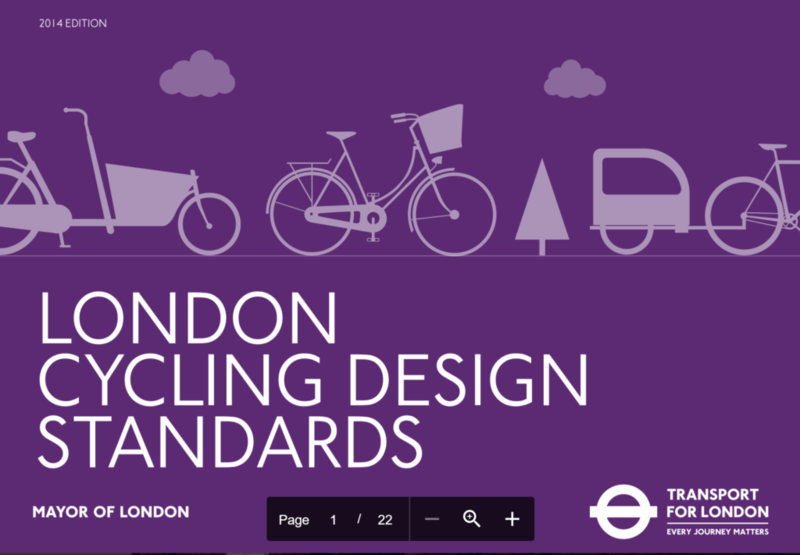 We’re calling on TfL and Croydon Council to insist on the very best design processes and standards as detailed in, ahem, TfL’s London Cycling Design Standards manual. 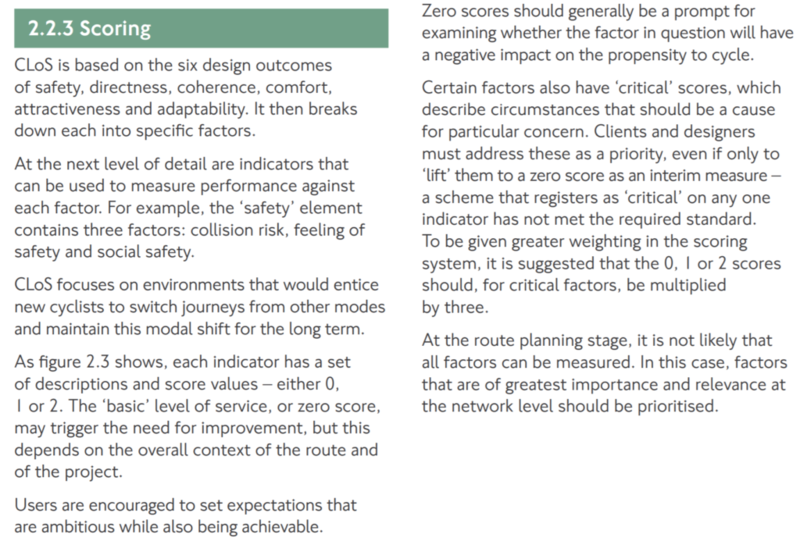 We want them to specify cycling facilities that will provide high Cycling Level of Services scores as set out in that manual, which means that people will be presented with safe, convenient and easy to use cycle routes. TfL wouldn’t design roads for drivers that didn’t meet those criteria, so why penalise people who want to use their bikes? We want them to carry out the Cycling Level of Service assessment now, before the consultation closes, rather than hide by red tape and excuses, as explained in their refusal of this Freedom of Information request. 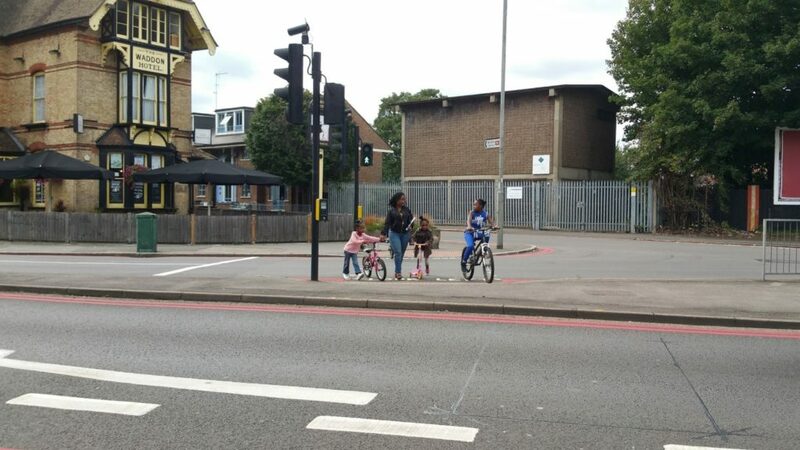 We want Croydon Council to insist that TfL design cycle routes to and through the Fiveways junctions that are as good as the best in London and can be used by all cyclists, including those with disabilities. Not our words – theirs, as contained in the borough’s draft Cycling Strategy 2017-22. 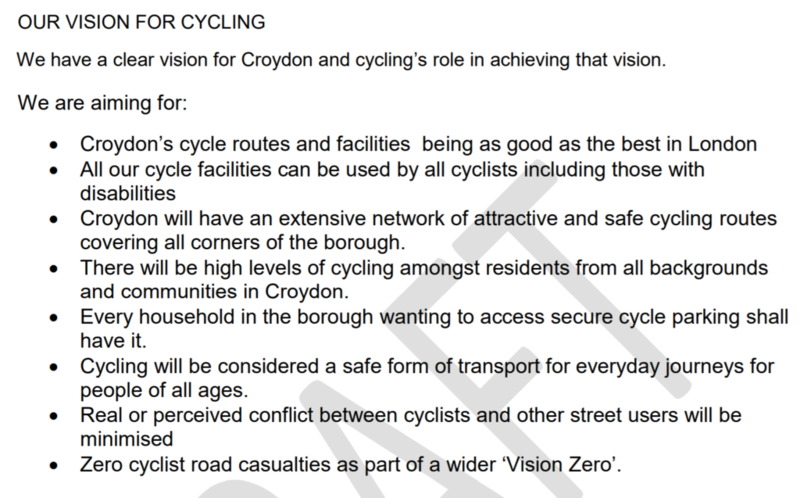 Finally, TfL and Croydon council need to stop paying lip service to cycling and instead start “Delivering the benefits of cycling in outer London”, the publication of the same name published in 2010. We have all the studies, grand plans and fine words we need. It’s time to put them into effect, for the benefit of everyone, not just white middle-aged men in lycra on road bikes. 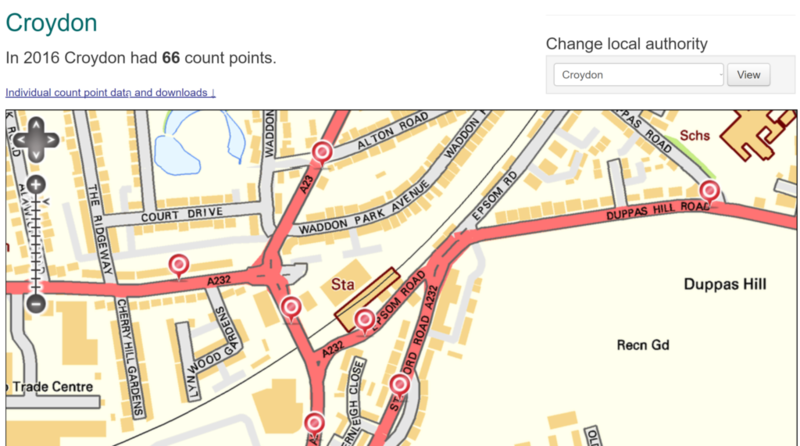 Can Croydon’s streets be ‘Healthy Streets’?